This week Microsoft has announced that it has stopped production of Xbox 360 consoles after a little over 10 years. The Xbox 360 has been an extremely useful machine for me, and formed an integral part of my computing life. I closely watched the development of the 360 back in 2005 (I was a bit of a fan of J Allard too) but I didn’t make the purchase until a year after the original release of the console. My first Xbox 360 was the Premium version. It was white and huge with a very loud fan. I actually didn’t time my investment all that well as a slightly upgraded Elite version came out soon after I got mine, but they all supported the same software so it didn’t matter all that much. 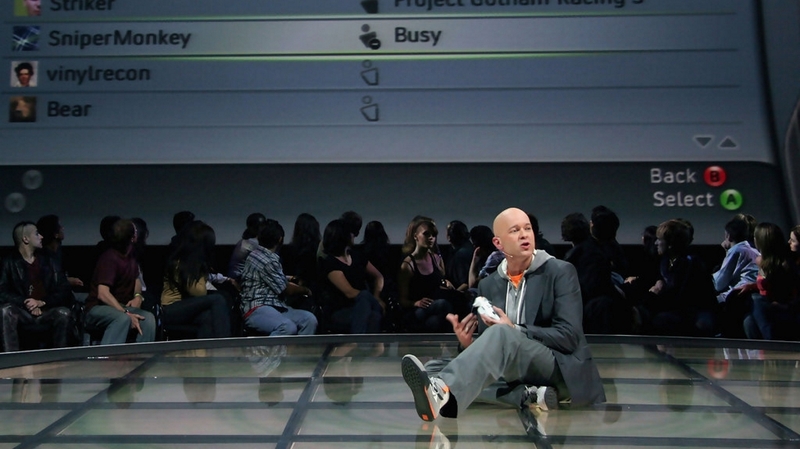 Back then the 360’s operating system was very different to the one we have today. The original Dashboard included different colour blades which you navigated through left and right to find the section you wanted. 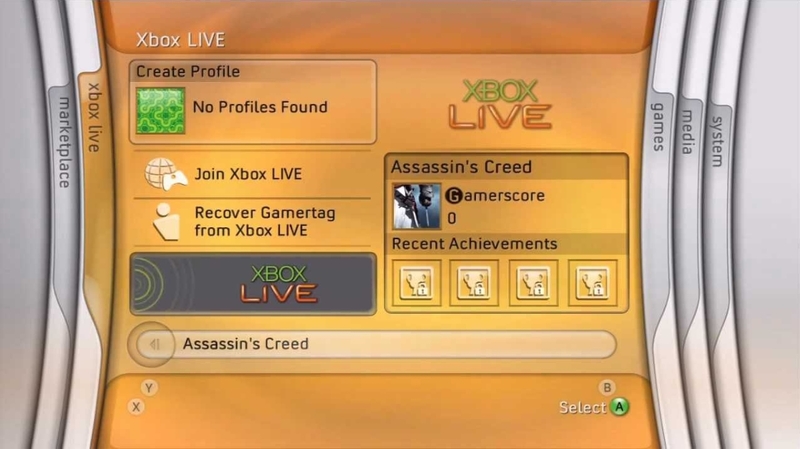 I mostly used it to play Xbox Live Arcade games like Geometry Wars, as well as some of the more blockbuster titles such as Gears or War and Crackdown. I used a VGA cable to connect the Xbox directly to desktop computer monitor – so I was either using my PC or using my Xbox which meant I often ended up using video and entertainment apps in a window while multi-tasking on the PC and the Xbox 360 usage dwindled. Over the years the software has seen a huge amount of updates too. The current version is such a long way from the original that it’s quite impressive to think how far the device has come. I still use my 360 pretty much every day when I am at home. Over the years the main use of the console has changed and now it is mostly used to watch video on Netflix or listen to music on Groove. Most of the time I just use the media remote which is able to turn on my TV, change the volume, and control the 360 software all without using a controller. 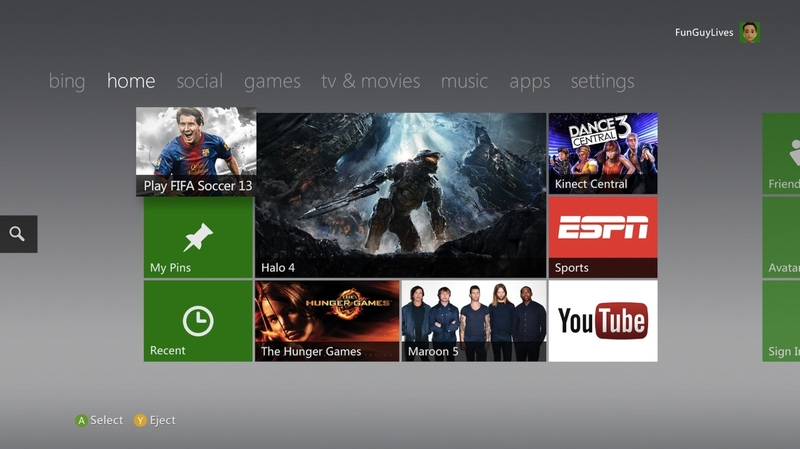 Essentially my Xbox 360 has become a Roku – with the option of playing games when I want to. This year I plan on replacing the 360 with an Xbox One. There are plenty of games I want, but the general improvements to the software and user interface are enough to make a noticeable difference to how I get my entertainment. The coming addition of universal Windows apps means that (hopefully) more Windows applications will run directly on the console. I won’t lose anything with the upgrade either, as most 360 games are backwards compatible with the Xbox One. Being a huge productivity nerd, I like to regularly review the systems I use to ensure that I am getting the best out of them. 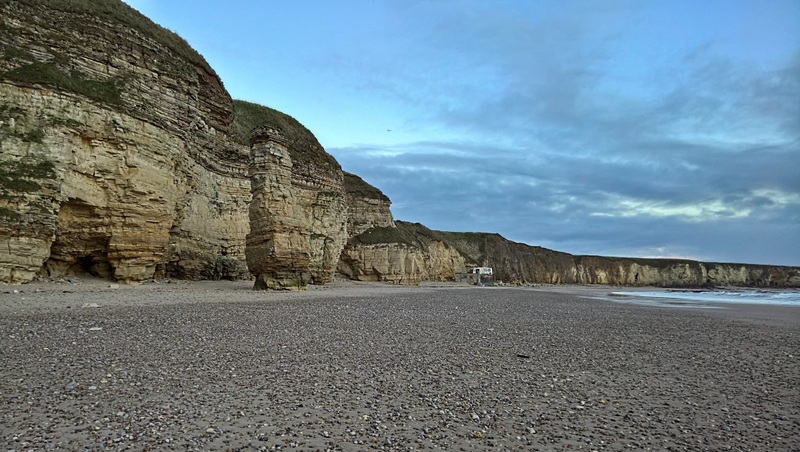 In December 2015 I sat down to do my yearly review of my productivity system. 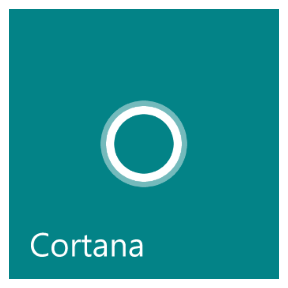 One of the tools I had on my list was Cortana. Something about Cortana is different to other tools I use like Outlook or Wunderlist – the very nature of her being a personal assistant means that she’s more of a single interface to many other things, rather than just an “app for email” or an “app for tasks”. The very fact I have chosen to refer to Cortana as “her” in this article proves that she’s not just an app to me. It was obvious to me that I wanted to continue to use Cortana, but I also realised that I wanted to dig a little deeper into what makes her useful, and what I would like to see improve. This month marks two years since I first started using Cortana, so I figured now would be a great time to step back and look at how my use of Cortana has changed over time and where things are going in the future. 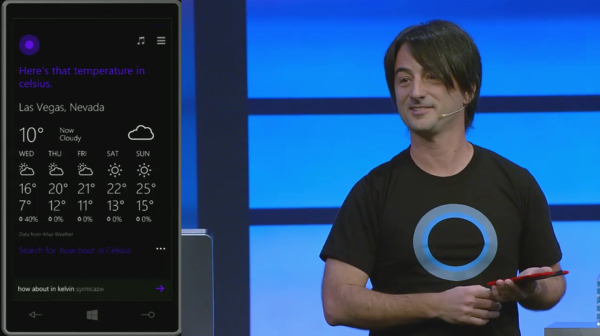 I remember watching Joe Belfiore reveal Cortana to the world in April 2014. She had more personality than Google Now and was more personal than Siri. Microsoft’s entry to the personal assistant category was well anticipated and rumours had been circulating for a while. My first real exposure to Cortana was on my Lumia 920. At first, I had to change my regional settings to the United States in order to get her fully functioning on my phone. There were a few side effects from making this change, but I immediately decided it was worth it in order to have this new experience. I asked her for facts, told her to make phone calls, and got her to remind me to do things when I arrived at various places. The speech recognition at this stage was extremely good and Cortana replied in the sassy American voice I recognised from the Halo series of video games. Because I was already invested in the Microsoft ecosystem, she already knew my calendar appointments and favourite locations. I was immediately comfortable and the animated circle became a familiar feature of my phone in no time. Microsoft’s initial vision for Cortana set her out to behave like a real personal assistant – to be like a loyal employee. 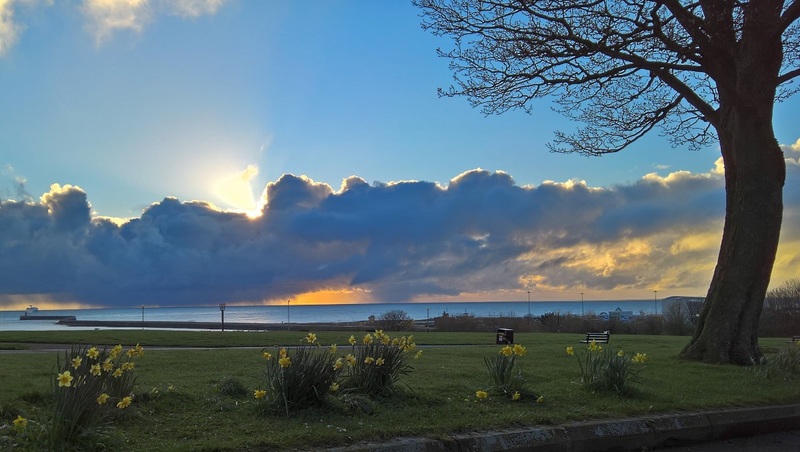 The aim was to build a proactive software agent to help people get things done. I felt that things were heading in the right direction. When Cortana came out in the UK properly, I naturally switched my regional settings back to UK English. Part of me was a little disappointed that Jen Taylor no longer voiced Cortana. In my eyes, she lost a little bit of her personality and became more formal with her ‘BBC English’ accent and mannerisms. I eventually got used to it, but it did show me that the way a computer speaks to us is important to how the relationship works. 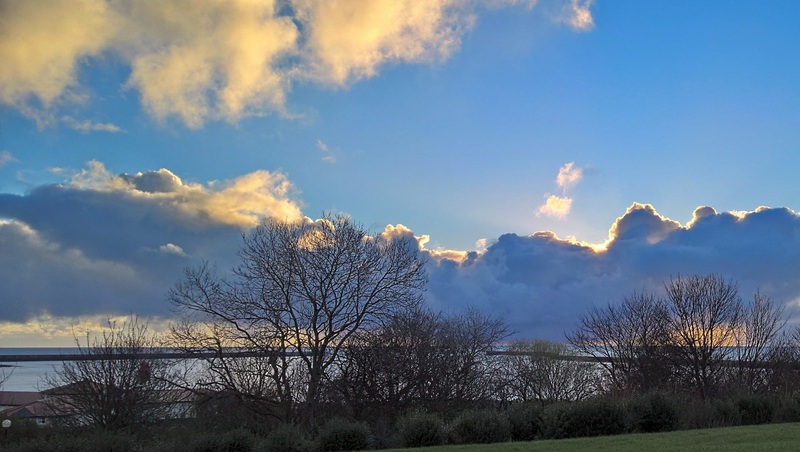 If we are to assume Microsoft’s vision of Cortana as a personal assistant or a loyal employee, I had been building a working relationship through this characterised interface over the last few months. When Jen’s voice was taken away from me – I think I lost a little piece of Cortana. 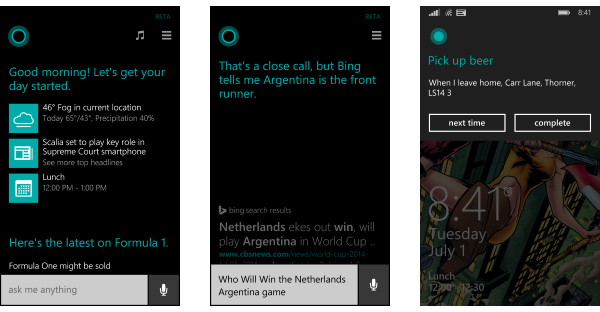 Voice aside, everything was good and features got improved over time – events like the World Cup were added, general chitchat was updated regularly, and most importantly, Cortana got better at being predictive. Information was shown as soon as you tapped on her animated tile, bringing up traffic and weather information without even needing to ask. While I am still pleased with Cortana over all, I would be lying if I said I completely satisfied with the progress that has been made. Cortana has moved from Windows Phone 8.1 to a new unified Windows 10 platform that works on both the PC and phone, but along the way there have been some casualties in her features. A lot of these casualties are cosmetic, for example, Cortana’s circle used to give a sad emotion animation when you had to edit some text that she’d failed to recognise correctly. This little detail was subtle but extremely powerful – a surprising amount of emotions can be shown with animated circles. 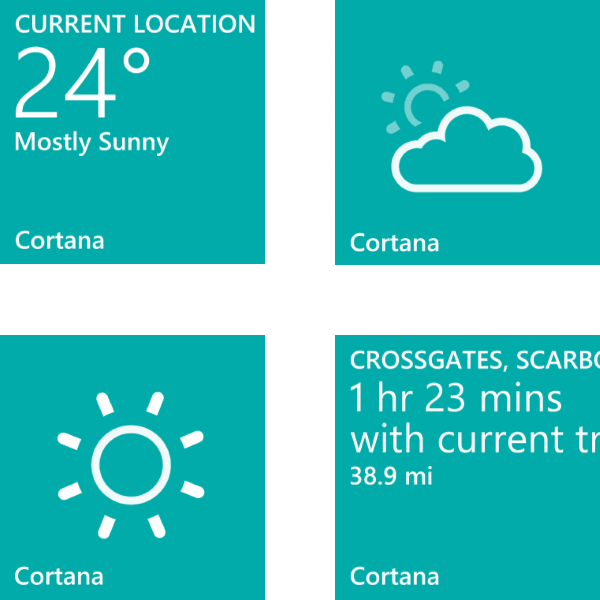 A more substantial example is that Cortana’s Live Tile (shown above) for Windows Phone 8.1 was actually useful – her circle shape would morph into a sunshine animation to let me know the weather, or she would show me when to leave the office in order to beat the traffic directly on my start screen without even loading her up. 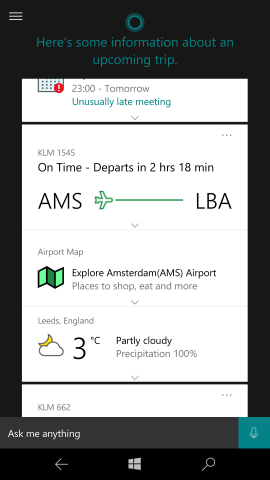 You could even pin individual items like weather or news as Live Tiles, acting as a deep link into Cortana directly from the Start screen. Asking “How many calories in a Coke?” used to work, but now it doesn’t. Why? Who knows? she just forgot. Possibly more a fault of Bing than Cortana – some relatively simple questions like “How many days until 2017?” do not work at all. 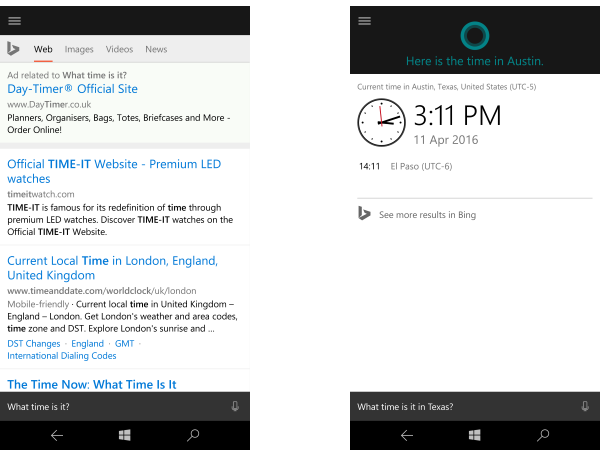 One of the most bizarre issues is that asking “What time is it?” takes me to a Bing search page, rather than having Cortana tell me the time. Interestingly, when I say to people that this question doesn’t work as it should, I am often met with resistance. People often state that I can look at the time on my watch (or Band) but this completely misses the point of this interaction. If I’m using my voice to talk to Cortana, I expect her to reply using her voice too. Strangely, asking “What time is it in Texas?” yields the time over the pond. Why can’t I just get the time where I am? When she does reply with her voice, the experience isn’t that great anyway. For some reason the screen is always activated even for voice only replies. While this doesn’t negatively affect the interaction in most cases, turning the phone screen on while the device is in my pocket is a recipe for disaster. I don’t know why the proximity sensor isn’t used to make a decision about illuminating the display. She doesn’t understand how to spell my girlfriend’s name, there is no way to correct her. I don’t work on public holidays! Stop telling me it’s time to go to work! Saying “Hey Cortana” doesn’t always work. This needs to always work. Microsoft Health integration is only in the US for some reason. 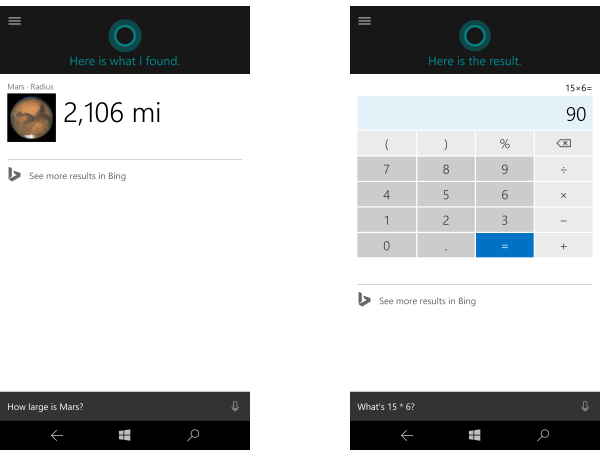 Cortana is unusable from Microsoft Band when using Windows 10 Mobile. She doesn’t sync her tasks or reminders with Wunderlist. For some reason she asks me where I live and work over and over again. Anyone else get this? People in the UK obviously don’t need parcel tracking. There is no way to remove awful news sources like the Daily Mail from turning up, so I have to disable all news features. How does she still not understand Formula 1? It’s a big sport with a world-wide audience! She can shuffle all my music, but can’t play music by mood? Who shuffles 10,000 songs anyway? Okay, so this may sound like a long list of complaints but this is only because I want to see Cortana be truly great. I feel like the current iteration has been a step backwards in some ways. Cortana’s core functionality is still extremely useful and I regularly use her on my Lumia 950 XL and on my Surface running Windows 10. I also use Cortana inside of Microsoft Edge. 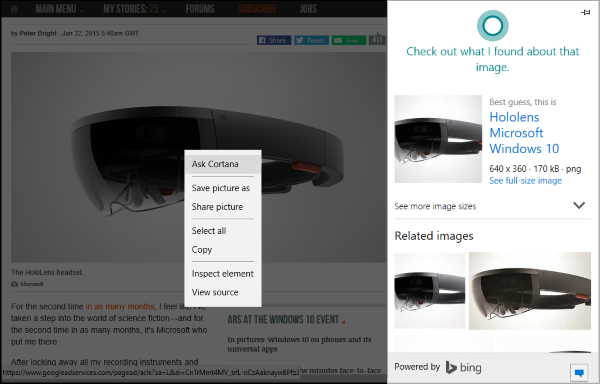 You can right click on an element and “Ask Cortana” about it. Note that she’s smart enough to take in the context of the whole page too. You can even do this for images. Building Cortana directly into apps is one clear way that Microsoft can improve the platform and I’m looking forward to seeing more of this. 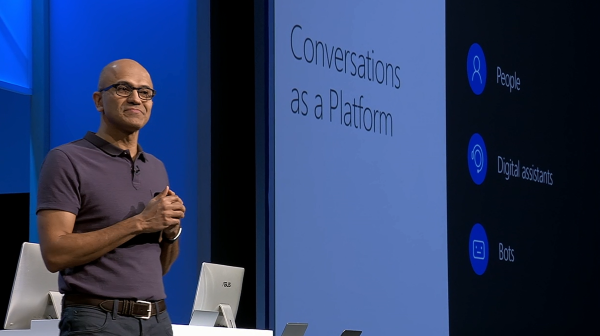 Microsoft’s Build conference has just passed, and at it we saw a number of announcements on, what the company is calling, “Conversations as a Platform”. 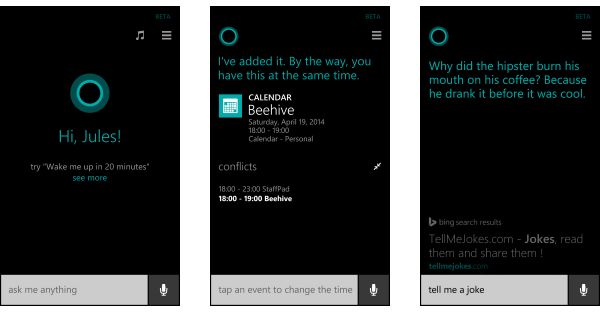 A big part of this strategy is improving Cortana. Marcus Ash gave a great demo of some of the new features coming to the Anniversary update of Windows 10, including Cortana working on the lock screen, as well more Google Now inspired cards, and the ability to include more app integrations directly into actions which are surfaced directly in Cortana’s UI. As part of his demo, Marcus showed some very interesting new experiences where Cortana was integrated into a previously unseen version of Outlook. Not only did Cortana have access to the calendar, she had access to email too – even surfacing tasks directly from email messages. I like the look of this proactive Cortana, and this is something that directly relates to my original task of trying to review what Cortana means for my productivity. Another useful feature was where Marcus asked Cortana “What toy store did I go to last year at Build?” and she found the toy store he visited last year when he was in San Francisco. The potential of this is really great and I like the idea of Cortana’s memory being improved. The demonstrations shown in the keynote were only some of the upcoming Cortana features in the Windows 10 Anniversary Update. 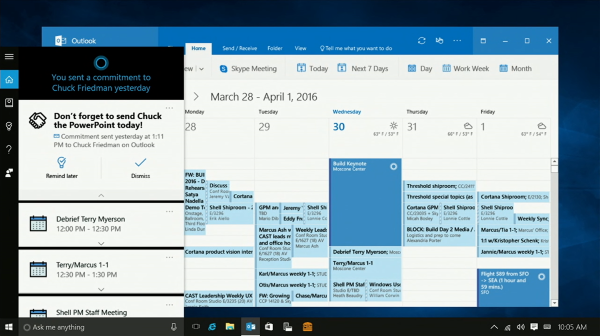 Other sessions throughout Build showed Cortana’s integrations in the Windows Ink Sticky Notes as well as the Action Center. Cortana will also manage some of the cross device features, like being able to do text messaging from a PC and getting notifications on the PC when the phone’s battery is low. 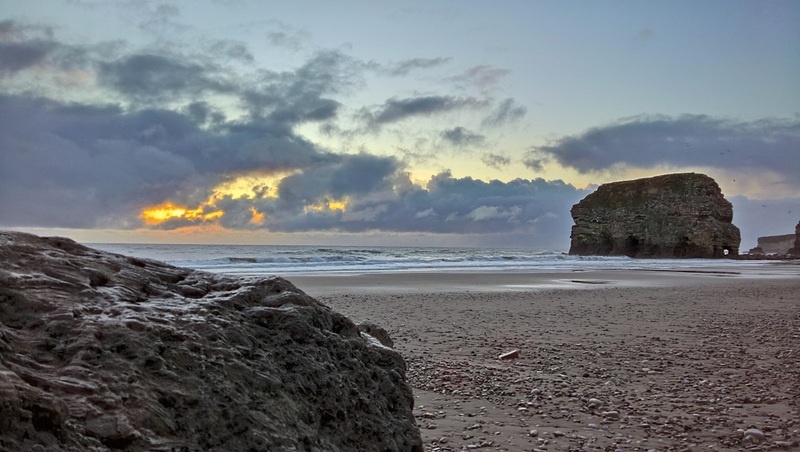 She’ll also take on navigation duties in the Maps application – replacing the more generic sat-nav voice with her own. Microsoft’s “Conversations as a Platform” strategy doesn’t just include Windows though, and there was a great demonstration of another application which is already commonly used for conversations – Skype. Lili Cheng showed a demonstration of a future version of Skype which had Cortana directly built in. 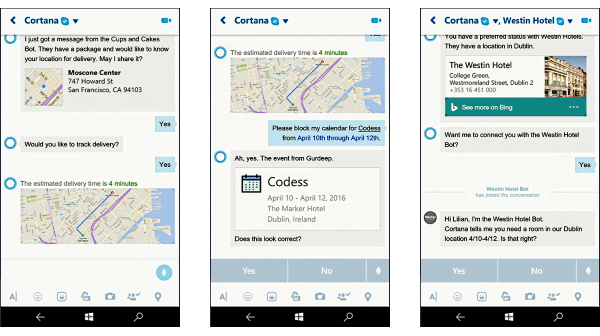 As part of this new integration, Cortana is always available and is able to keep track on conversations and contacts. This is similar to the proactive help offered using the Outlook integration mentioned above. My favourite part of the demonstration was when Cortana was able to work alongside a third party bot in order to complete tasks. 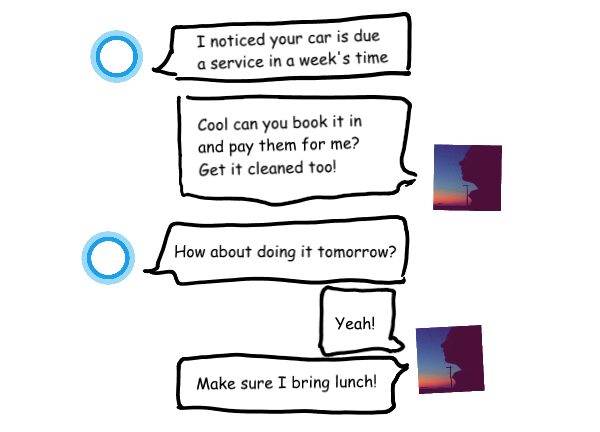 Using bots like this is something that interests me greatly – and there I will write more thoughts on this in the coming weeks – but I really like how Cortana can act as an agent in order to get things done. In a lot of ways, the demonstration of Cortana working inside of Skype effected my thinking the most. It’s now clear to me that the instant message-like conversation is a superior method for communication with Cortana. While I do like the proactive canvas which is launched when you open Cortana in Windows, having a single entry box and an answer that just disappears into the void is extremely unsatisfactory. Moving from the simple “Ask me anything and get a result” interface into a back and forth conversation will unlock so much potential in Cortana – it will be a lot more how you’d talk to someone (like a personal assistant) over Skype. But just having a list of messages sent back and forth is not enough – Cortana has to remember the conversations we’ve had. That way, when I correct her on spelling my girlfriend’s name, she’ll remember it for next time. It’ll give her the context to make the best decision on the instruction I have given her via my voice. When you think about it, it’s pretty crazy that Cortana can go through my calendar and look things up, but can’t remember things in the conversations we had. I’d also like to see Cortana integrated into the Microsoft Band more deeply. There were hints at this kind of feature in the Microsoft Future Vision video from 2015. It depicted a future version of Cortana sensing that the user had gone “into the zone” and automatically blocked unwanted distractions. It’s also pretty obvious to me now that the voice interface in Cortana needs to move into a more natural language model. When I talk to her through my headset I’d like her to be able to continue the dialog without me having to switch to my phone. All of this conversation should go into the same chat history which she’ll remember and can be used to improve conversations over time. This will also unlock completely voice only devices like Amazon’s Echo. Overall, I do still enjoy using Cortana, but I feel like the upgrade from Windows Phone 8.1 to Windows 10 has not been kind to her. I hold out hope that Windows 10’s position as the base version of Windows moving forward means that the days of the big platform changes are over, and the various teams working on Cortana can continue to do so without having to rewrite components over and over again. Cortana will continue to be part of my daily workflow and will continue to be one of my main tools for productivity. I wonder where we will be in another two years.